I hope you’re ready to channel your inner MacGyver, because we’ve collected a list of some of our favorite guitar hacks to help make your life as a musician a little easier. Some are more out there than others, and not all will be right for you (to be honest, some of these might not be right for anyone, like #9 for instance…), but if nothing else, they all speak to the power of thinking outside the box. As I’m sure most of you have figured out by now, your guitar is difficult to keep in tune right after changing your strings, especially if they weren’t stretched properly during the process. If you take a cloth and slide it up and down along the string while pulling on it, the friction created from the cloth will heat up the strings and get them used to the new tension much faster. If you’ve got some loose screws anywhere on your guitar, you can simply remove the screw and drop in a toothpick, or a piece of a toothpick, into the hole. Put the screw back in and tighten it up. Now that the screw has something to grip onto, it should work good as new. When it comes to tuning your guitar, a faster and more effective way is to use your neck pickup and roll the tone knob all the way down. The way electronic tuners work is by listening for a fundamental pitch. When you play a note, you are playing a fundamental pitch that has lots of related harmonics stacked on top of it. By switching to the neck pickup and rolling down the tone knob, you’re essentially turning down those harmonics, making it much easier for your tuner to hear that fundamental note. When going to record a solo, mute your strings with a cloth or fretwrap tied loosely around your strings like a capo. This will help to mute any unwanted notes before they would even have a chance to ring out. If you’re guitar is having trouble staying in tune, you can take a regular pencil and “draw” inside of the nut slots. The graphite from the pencil will act as a lubricant and keep the nut from clutching your string too tightly. There will come a time when you have to remove the knobs from a pedal or guitar. The easiest way to pop those things off is to take a flat shoelace and slide it underneath. Wrap the shoelace around the post a few times and pull up. Voila! 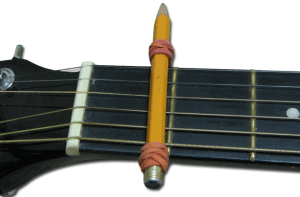 You can make your own capo by using just a pencil and a rubber band (or some other elastic material). 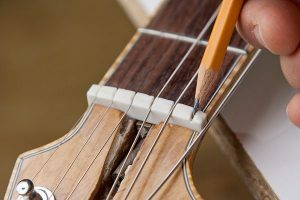 Simply wrap the rubber band around one end of the pencil, and place it against the fret of choice. Then wrap the other end of the rubber band around the the other end of the pencil and make sure there is enough tension to hold down the strings. It won’t be the best sounding capo in the world, but it’ll work in a pinch. If there’s not a pencil nearby, you can also use a pen, a marker, a fork, etc. If you want to give your sound another little layer, you can weave a dollar bill through the strings of your acoustic near the bridge to achieve a “snare” like effect, much like that of Johnny Cash when he played with the Tennessee Three and didn’t have a drummer. If you want to get a wah effect but don’t have a wah pedal, you can make your own Poor Man’s Wah using the pickup selector on your guitar. Just roll your neck pickup’s tone knob all the way down, and your bridge pickup’s tone knob all the way up. Then as you’re playing, quickly switch between your neck and bridge pickups. Or if you want to get really crazy with it, you can do what this guy did and take it to the next level. If you’ve got a small pedal that has to run off of an adapter, there’s an easy hack that will allow you to hook up a 9v battery to power it that you can quickly make out of some old electronics just laying around your house. I could try to explain it myself, but I think it would just be easier if I sent you guys to this video so you can watch these guys do it. The hack we’re talking about is the first one in this video, but the whole video is worth checking out if you want to learn a few other guitar pedal hacks. This last one is something simple, but not one I had even thought of before. If you’ve just changed your strings, but don’t have a wire cutter to get rid of all the loose ends, you can just wiggle the ends back and forth a few times and they’ll break easily. The CAGED system is undoubtedly one of the best guitar hacks there is—it provides a simple framework for learning how to play a scale across the entire fretboard. If you’re not familiar, check out our overview of the CAGED system HERE. #10 blew my mind. I'm going to try that with my mini Bonamassa Fuzz Face! Great hacks from a great company! !